With the meteoric rise of social media such as Facebook, Twitter, LinkedIn, and others, we should ask how these modes of computer-mediated social interaction are affecting individuals, groups, and culture at large. One may have hundreds of Facebook “friends,” but what kind of friends are they? And what kind of “community” is Facebook and related social media outlets? What are the beneficial elements of social media and what are its dangers? Consider two episodes that highlight the strengths and weakness of this new medium. On another occasion, a man decides to use a Facebook post to vent his pent-up frustrations against someone he knows. He attacks the person’s character and issues false charges. Although both he and the person he vilifies are Christians, he fails to communicate first with that person about his complaints (see Matt. 18:15–20). Instead, he issues a broadside in a media environment where all his “friends” can read the post. This takes gossip to a whole new (social media) level. Feelings are hurt, lies are broadcast, and no one is the better for it. Although there are other forms of social media, we will concentrate on the strengths and weaknesses of Facebook, given its size and influence. The ascent of Facebook has been remarkable. During the first quarter of 2009, five million people joined Facebook every week. From August 2008 to March 2009, its membership doubled from one hundred million to two hundred million and the vast majority of its members (140 million) have joined since February of 2007.2 Facebook has rapidly generated a spontaneous ordering of human communication that is unique in history. Internet technologies have swiftly changed cultures around the world through their speed, availability, and new contexts for information exchange, whether through text, audio, still images, or video. The rise of social networking has raised significant questions about the meaning and experience of community in the digital domain. Christians believe in authoritative principles for human flourishing designed by God. Therefore, they should be especially concerned with how these new and nearly ubiquitous technologies are shaping ourselves and our society. If the greatest commandment is to love God with all of our being and to love our neighbor as ourselves (Matt. 22:37–39), then it behooves us to discern the strengths and weaknesses of these technologies and “hold on to the good” while avoiding “every kind of evil” (1 Thess. 5:21–22).3 The place to start is at the beginning—the beginning of humanity. Only this framework is large enough to give us discernment regarding the wise use of these media. Human beings, as image-bearers of God, are social creatures. We were designed by a loving God to demonstrate love for God and for others. In this context, we are to develop God’s good creation for human flourishing and God’s pleasure. The first man, even before the Fall, would have been lonely and incomplete without another image-bearer of God who was fitted to be his partner and lover. Although put into a garden of goodness with unrestricted fellowship with God (Gen. 1–2), our first parents listened to the lie of the serpent, opting to go their own way by doing the one thing that God had forbidden: eating from the tree of the knowledge of good and evil (Gen. 3). You are the light of the world. A city on a hill cannot be hidden. Neither do people light a lamp and put it under a bowl. Instead they put it on its stand, and it gives light to everyone in the house. In the same way, let your light shine before men, that they may see your good deeds and praise your Father in heaven" (Matt. 5:13–16). To be salt and light requires an understanding of culture and its effects on us all. We should be like the tribe of Issachar, “who understood the times and knew what Israel should do” (1 Chron. 12:32). Human culture is multifaceted, variable, complex, and often invisible. Put simply, culture is the mark that humans make on nature and on each other (see Gen. 1:26; Ps. 8). However, that mark may be blended into our lives in ways that we hardly notice. Competent cultural criticism brings the cultural background into the foreground, as Marshall McLuhan observed. This allows us to discern what is typically out of view. The unique human touch takes manifold forms— involving the sartorial, the architectural, the orchestral, the automotive, and so on—and extends to various discursive communicative media such as spoken language, smoke signals, forms of signage, and written language. More recently, it has included electronically mediated communications, such as the telegraph, telephone, radio, television, and Internet. The latter has afforded us, in a very short time, a plethora of possibilities for communication, from e-mail to text messaging to blogs to what is now called “social networking,” a phenomenon that occurs on the Internet by broadening the kinds of computer-mediated social contact offered by e-mail, blogs, or Web pages. This creates a digital agora, but with no one there in the flesh. Bodies are absent, but interaction is very present in this new electronic forum. To put this in Neil Postman’s terms, technological change produces “ecological” effects that go beyond minor adjustments in a culture.5 For example, television changed American culture economically, politically, and intellectually. It was not merely another medium added to newspapers, the telegraph, and radio. Thus, political debates in American politics went from being intellectually robust exchanges, often lasting for hours, to televised events in which the one with the best looks and one-liners wins.6 In fact, Postman claims that the sensibilities fostered by television affect our very sense of truth and falsity. This observation could be extended to say that all forms of electronic communication shape our ways of approaching and understanding the world. It therefore seems important to explore some basic cautions in navigating this new world before giving some specific principles for engagement. Facebook and related social media tend to foster the overexposure of the underdeveloped self by facilitating the mass distribution of text and images related to oneself. The problem is that one may expose a self that is not mature enough for that exposure. As the Book of Proverbs so often says, the wise hold their peace, but fools proclaim their folly. One should choose confidants carefully (see Ps. 1). Some aspects of one’s life should be concealed. There is much folly, frivolity, and triviality in social networking. Not everyone should know everything about everyone. While secrecy wrongly conceals vices or wrongdoing, confidentiality is prudent because it shields things that need to be kept out of view. Social networking makes the broad distribution of text and image virtually effortless, and many lack the discretion required to hold their peace. One Facebook post lamented that a woman’s husband had treated her harshly in a way that never happened while they were dating. This was a cry of pain, but Facebook was not the place to air it. This confidence belonged in a marital discussion, in prayer, and perhaps in a pastor or counselor’s office. One should also be careful of gossip. Given the nature of Facebook, gossip can spread rapidly and widely. Gossip can be defined as repeating unfavorable things about people for no good reason. Biblically understood, gossip is sinful and should be repented of. Some of the statements may be true, but they are unedifying and without constructive purpose.7 Paul includes gossip in several of his “sin lists,” putting it alongside adultery, murder, and so on (Rom. 1:29; 2 Cor. 12:20). Moreover, there is a time to retreat from words entirely, as the Preacher of Ecclesiastes warns: “The more the words, the less the meaning, and how does that profit anyone?” (Eccl. 6:11; see also 5:1–2). The same is true for images. Many Facebook users recklessly post photographs of themselves in immodest and/or narcissistic poses. Even innocent photographs may be misunderstood given the often-ambiguous nature of the image. Facebook comments and images have come back to haunt their authors, as when potential employers assess the Facebook pages of those they are considering hiring. What is called social media may become profoundly antisocial. Some who are immersed in social media prefer such media over face-to-face encounters. This furthers the technological problem of “the absent present”: although someone may be right next to you, she is immersed in her cell phone, Blackberry, iPod, or laptop. For example, students in the classroom may use their laptops to take notes or perhaps look up something related to the lecture. As a teacher, I have found that quite often students are not using their laptops in these ways, however, but are doing any number of other things online, including checking social networking sites such as Facebook and eHarmony. Many students are prone to this, since they have grown up with multitasking as a habit. The idea of undivided attention strikes them as strange and uninviting. But trying to divide one’s attention between the classroom (the lecture, student comments, the textbook) and social media impoverishes the classroom, vitiating it of its unique possibilities for learning through lecture and dialogue. John Medina argues that the brain itself is incapable of multitasking effectively, whether in the classroom or elsewhere.8 For these reasons, I have banned laptops from my classes at Denver Seminary and have added the following comment to my syllabi: “No laptops are allowed in the classroom. While many students will use them responsibly, many will disappear behind the screens. For this reason, I am banning them from the classroom. The classroom needs to be a zone for knowledge and inspiration. Knowledge needs students and students need knowledge. We need to breathe ideas together without the distraction of alien mediation. Therefore, please print out the class notes for the day and be ready to take notes and discuss the material face-to-face, voice-to-voice, soul-to-soul.”9 I find that the unmediated classroom is far better than one mediated by computers and their manifold distractions. "You have heard that it was said, “Do not commit adultery.” But I tell you that anyone who looks at a woman lustfully has already committed adultery with her in his heart. If your right eye causes you to sin, gouge it out and throw it away. It is better for you to lose one part of your body than for your whole body to be thrown into hell. And if your right hand causes you to sin, cut it off and throw it away. It is better for you to lose one part of your body than for your whole body to go into hell" (Matt. 5:27–32). 2. Resolve not to go online immediately before bed or immediately after waking up. These significant times of the day should be reserved to memorize Scripture, meditate on it, and pray (See Ps. 119). One should start well and end well. 3. Practice authentic Facebook engagement. Facebook caters to narcissism, with many people presenting flattering images of, and words about, themselves that are unreal. Therefore, we should evaluate the “presentation of self in everyday life” on Facebook.10 Does the content we post reflect our God-given nature? Are we being authentically ourselves here, or are we hyperactive and hyperconnected pretenders? God knows: “For God will bring every deed into judgment, including every hidden thing, whether it is good or evil” (Eccl. 12:14). 4. Focus on one or two Facebook friends for one month for special involvement. One’s involvement in Facebook can become more meaningful by picking just a few people to focus on, instead of distributing one’s attention more widely but superficially. Keep your other friends, but pay special attention to these souls. Pray for them; send messages only for them; post photographs with them that are meaningful, and so on. Then consider whether this has deepened your relationship with them. These four recommendations are sane and solid. I often challenge people to develop a philosophy of Facebook to guide their involvement, and Rice’s encouragement should spur reflection. On the basis of my experience with Facebook, let me commend three other principles. 5. Practice skeptical Facebook activities. Just as one might give a false impression of oneself through doctored photos or hyped-up words, one should realize that others are likely doing the same thing. In other words, Facebook may not be the best source to fathom someone’s character or skills. The image presented may not be the reality reflected by the person herself. It is unwise to grant very much trust to someone only known through Facebook, especially given all the scams and frauds out there. In some cases, I am able to have meaningful interaction with strangers who are Facebook “friends.” Recently, a troubled young Christian from Asia sent me an instant message about her fear of betraying Christ and never getting free of sins that hinder her obedience to God. Although her English writing was rough, I tried to understand her plight, sympathize with her, and offer her biblical counsel. We exchanged messages for about fifteen minutes and I assured her I would pray for her and that she could contact me if I could be of further help. While this kind of interaction is far removed from real pastoral counseling or the accountability of a small group, it seemed that I was able to offer this troubled soul some spiritual substance through Facebook. As a Christian philosopher, I also seek to defend the truth and rationality of the Christian worldview wherever I find a healthy opportunity to do so, even if it is on Facebook (1 Peter 3:15–16). If I sense in the Facebook interlocutor a genuine interest in my arguments, I will continue to interact. But if there is flippancy and belligerence (all too common in social media), I disengage, not wanting to “cast pearls before swine,” as Jesus said in Matthew 7:6. Some engage social media outside of these boundaries. Some even advocate social media as a form for the church meeting itself. One author proposes “SimChurch,” in which people congregate not in the flesh, but in virtual environments through the use of avatars (graphic digital identities).12 In the summer of 2009, I was on a BBC radio program with someone who pioneered “Saint Pixels Church,” which caters to those who want their fellowship virtual instead of embodied. But I argued that those who sponsor such innovations have a deficient view of culture, the body, and the church. Given that human culture is fallen (James 1:27; 1 John 2:15–17), we must not embrace every innovation that emanates from the innards of a computer. Some things that can be done ought not to be done. As Paul said, “‘Everything is permissible for me’—but I will not be mastered by anything” (1 Cor. 6:12). While I cannot here offer a broader critique of the use of avatars in virtual worlds,13 we should consider that virtual representations of one’s self typically do not correspond very closely to the person behind them. One may argue that this masquerade is allowable in some entertainment settings (virtual or otherwise), but the virtual self should not be embraced carte blanche. Leaving one’s body behind (as one does in SimChurch or St. Pixels) allows for numerous cartoon-like possibilities, but it does not honor the biblical understanding of fellowship. Both the apostle Paul and the apostle John longed to be physically with the people to whom they wrote their Epistles. Consider the words of Paul as he began to pen the Book of Romans: “I long to see you so that I may impart to you some spiritual gift to make you strong—that is, that you and I may be mutually encouraged by each other’s faith” (Rom. 1:11–12). Although Paul was writing some of the most profound theology imaginable, he still desired to be together with those in the Roman church. The apostle John affirmed the same: “I have much to write to you, but I do not want to use paper and ink. Instead, I hope to visit you and talk with you face to face, so that our joy may be complete” (2 John 12; see also 3 John 13–14). The most profound elements of church life are not possible online, since they are embodied. One cannot offer “the right hand of fellowship” through an avatar, nor can one partake of communion or baptism, the laying on of hands, the anointing with oil, or corporate worship—all constitutive parts of church life and fellowship. Whatever our social media involvement may be, we must not let it eclipse the God-ordained structures of the local church. 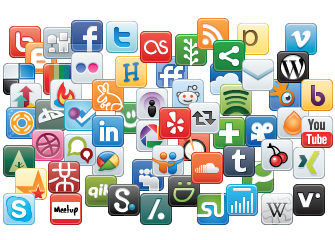 Social media provide fast, far-reaching, and free interaction with a huge number of people. Yet we should not become intoxicated with this rapidly expanding and easily addicting social world. While it offers the benefits of interaction with those outside of our general vicinity and can be used to communicate the truth in love (Eph. 4:15), it lacks significant elements of meaningful friendship that are found only through more embodied interactions. It can never substitute for the local church. However, if used intentionally, prayerfully, and with restraint, it can add a new dimension to our social interactions that might otherwise not be possible. 1 Clay Shirkey, “It Takes a Village to Find a Phone,” in Here Comes Everybody: The Power of Organizing without Organizations (New York: Penguin, 2009), chap. 1. 3 All Scripture quotations are from the New International Version. 5 Neil Postman, Technopoly: The Surrender of Culture to Technology (New York: Alfred A. Knopf, 1992), 18. 6 See Neil Postman, Amusing Ourselves to Death (New York: Penguin, 1985). 7 See Melody Green, “Gossip!” at: http://www.lastdaysministries.org/Mobile/default.aspxgroup_id=1000040808&article_id=1000008545. This was originally published as a tract by Last Days Ministries in the early 1980s. 8 John Medina, Brain Rules: 12 Principles for Surviving and Thriving at Work, Home, and School (Seattle: Pear Press, 2008), chap. 4. 9 See Douglas Groothuis, “Banning Laptops from the Classroom,” The Teaching Professor, March 2010. 10 This is the title of an influential book by sociologist Erving Goffman, first published in 1959. 11 For a biblical study on the meaning of friendship in the Book of Proverbs, see Ajith Fernando, Reclaiming Friendship (Downers Grove, IL: InterVarsity Press, 1991). 12 Doug Estes, SimChurch: Being the Church in the Virtual World (Grand Rapids: Zondervan, 2009). 13 I take this up in The Soul in Cyberspace (Grand Rapids: Baker Books, 1997). However, the technological involvements have far exceeded what I discussed there. Nevertheless, the basic principles I used to critique the technologies then available are still applicable today. Source: Douglas Groothuis, Ph.D., is professor of philosophy at Denver Seminary and the author of many books on apologetics. This article first appeared in the Christian Research Journal, volume 33, number 03 (2010).